I’m excited to tell you about my latest contribution to the 21-Day Sugar Detox program! You may already know that I’m fan of the 21-Day Sugar Detox. I have lots of 21DSD-friendly recipes on this blog, I became a Certified 21-Day Sugar Detox Coach so I can help others through this challenge, and over the last few years I’ve worked behind the scenes developing and writing some of the supplemental guides for the program. You can also hear me (and L as an infant) on the 21DSD Audio Support series, which is available to members of the online program. And now I’m a contributor to the 21DSD blog! 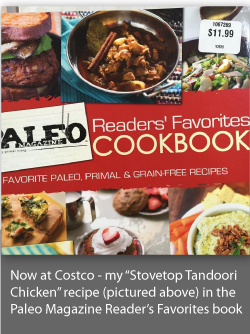 I wrote the latest post, Beyond Rice and Roti: Adapting Ethnic Cuisines for the 21DSD because I know how difficult it can seem to eliminate grain and legume-based staple foods while doing the 21DSD. I have had several of my Fijian Indian husband’s family members say that they couldn’t do (or finish) the 21DSD because they had to have their roti or their rice! But I assure you that it can be done! It just takes some commitment, some different thinking, and some help from those who have done it before. 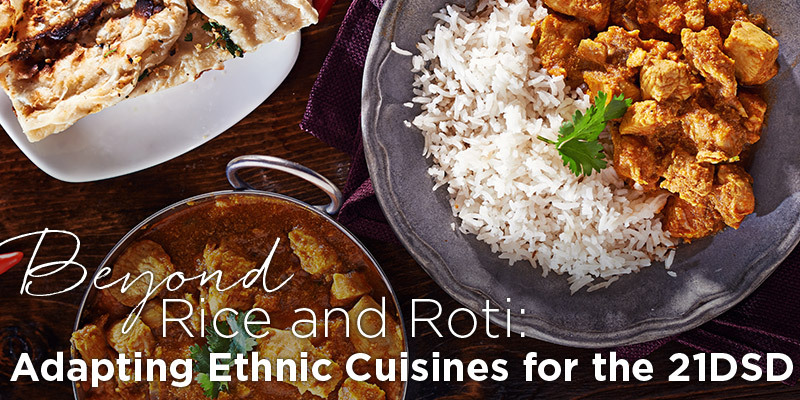 I had never tried Indian food until I started dating my Fijian Indian husband, and as part of his family, I have tasted and learned to make so many amazing foods that I probably wouldn’t have ever had the opportunity to try. I have learned to love dahl, make dosa, and chow down on homemade rotis. But when approaching a 21DSD, many grain and legume-based staple foods are off limits, which can feel daunting to someone who enjoys those foods daily and can’t imagine life without them. Many traditional staples have become refined, processed, junk-laden imitations of their original versions. I’m talking about tortillas, rice, noodles, and flatbreads, as well as sugar-sweetened and preservative-filled sauces and artificially flavored spice blends. If you went back 100 years, would you find artificial coloring in your tandoori masala? Or hydrogenated oils and dough conditioners in your tortillas? What about the amount of refinement and processing that goes into making any type of noodle? The answer: probably not. It’s important to realize that most of these staples are filler foods. They are cheap sources of carbohydrates that don’t add much nutrition, but instead make the meals stretch farther or cut the intense flavors of the dish. Some consist of ingredients that are difficult to digest, or are so refined and processed that they do more harm than good when it comes to our health. So what should you do if you are interested in accepting the challenge of completing a 21DSD, but the thought of limiting or eliminating foods that are a mainstay in your ethnic cuisine seems impossible?